When it comes to wine descriptions, even some of the most basic terms used can be confusing. To set you on the right tasting track, the Tasting Panel has put together a guide to the 5 most essential wine characteristics. Sugar, which occurs naturally in grapes, helps to elevate the array of flavours in a wine. It can add weight and power and help to give the wine a smoother and richer texture. While it was once thought that sweetness could only be detected on the front of your tongue, we now know it can be detected all across your mouth. Sweetness also helps to balance the acidity in wine – think of its role in Champagne and other Sparkling wines with high acidity levels. Too much acidity can overpower the core flavours of a wine, and create a sharp unappealing mouth-feel and taste. Acidity assists in bringing fruit flavours out of wine, especially in white wines. However, if there’s not enough, it can mean a wine’s fruit flavours don’t get the chance to show their best. It’s a fine balancing act achieved both in the vineyard and in the winemaking process. Tannin can come from either oak or from grape skin. While it is most often associated with red wines, it can also be apparent in some white wines, usually those which have spent time in oak. Tannin primarily effects the mouth-feel of a wine, creating varying levels of dryness. Too much, and it can create an unappealing astringency. A red wine with good levels of tannin usually has good cellaring potential. Alcohol is a natural by-product of the fermentation process, which adds a sensation of sweetness to balance the acids and tannins in wine. Alcohol also contributes to the texture or viscosity of the wine. Body is all about fruit weight. While Shiraz is a full-bodied red, Pinot is light bodied. Chardonnay is a full-bodied white, while Semillon is light bodied. Other factors that can influence body include alcohol, oak and fruit ripeness. 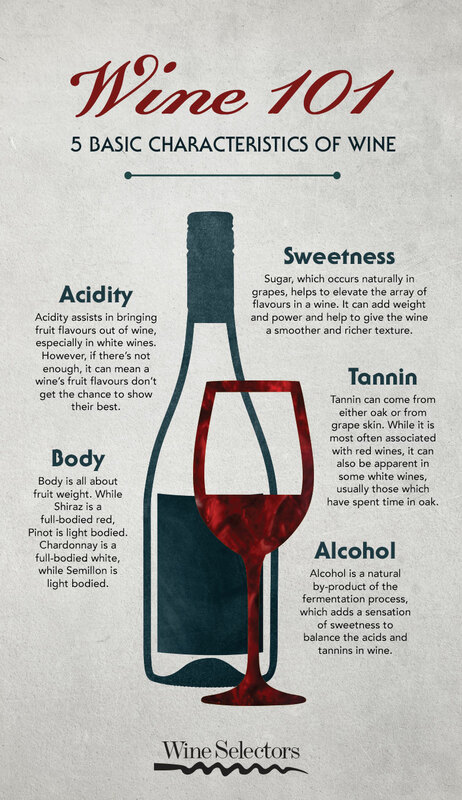 For more great wine tips and tricks, check out our Wine 101 page.